Those of us who grew up playing the original Nintendo Entertainment System remember full well the trials and tribulations of trying to get a game to boot up properly. No one among us hasn’t had to to blow into the business end of a cartridge before sticking it into the NES in order to avoid the dreaded blinks, perhaps the 80’s precursor to the Blue Screen of Death. Now that the NES is well into its 20’s, the problem is worse than ever. The chances of picking up a used NES that doesn’t suffer from a chronic case of the blinks are slim to none. The most popular solution these days is to simply buy a replacement 72-pin connector (the piece of hardware that allows the NES to interface with a cartridge) online. While this will fix your problem temporarily, it doesn’t get to the root of the issue. To understand that, we have to look at what causes the blinks in the first place. In order to prevent outside companies from developing games for the NES without first getting approval (and paying licensing fees), Nintendo developed a scheme called “10NES” that would not allow cartridges to run on their system unless it included a special chip. 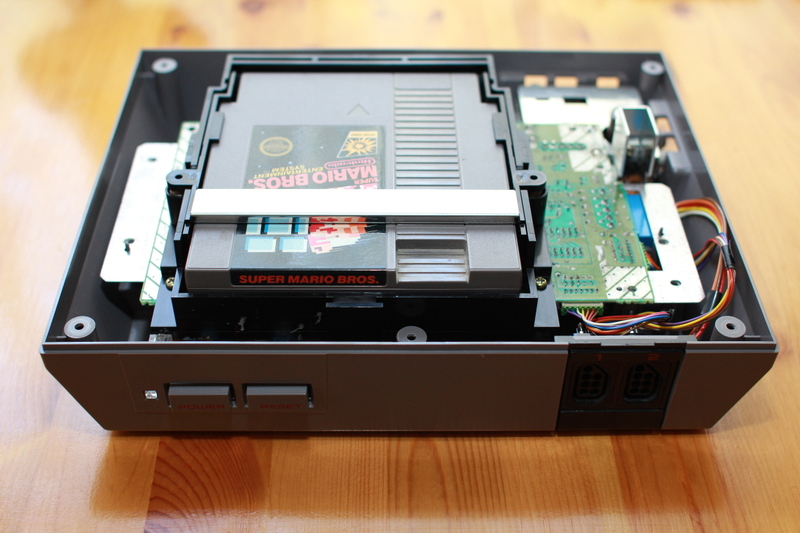 A 10NES chip resides on the NES mainboard, and each licensed cartridge has on its board the exact same chip. When the NES system is booted up, the 10NES chip inside the system sends a signal to the chip on the cartridge, which then replies with an authentication code. If the code is received by the 10NES chip inside the system, then the NES boots normally. If however the chip inside the NES does not receive the code, then the system simply blinks on an off until it is shut off. While this sounds all well and good in theory, in practice it was and still is a nightmare for gamers. The chip requires precise timing, which can be thrown off by anything that has built up on the corresponding pin or contact. That’s why blowing in the carts fixed the problem; the humidity in your breath moistened the contact just enough to create an unimpeded connection between the contact and pin. By the time the moisture had dried, the NES was passed its authentication routine. But blowing in your games causes long term problems that ultimately makes the blinks even harder to overcome. 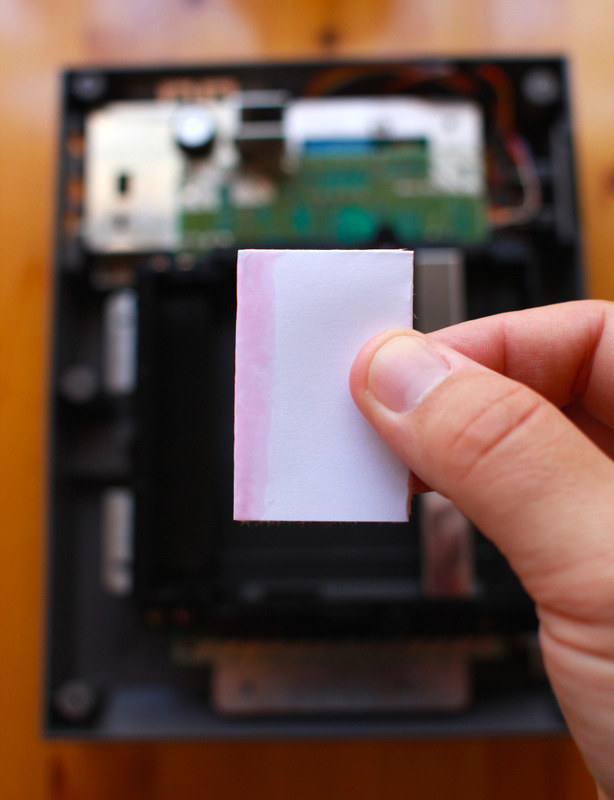 The contacts in the cartridges become dirty at an accelerated rate and the metal on the surface becomes oxidized. Both of these problems lead to a poor connection between your game and your NES, which results in a more stubborn case of the blinks and problems with graphical glitches once the game finally loads. • 1 sheet of high-grit sandpaper. I’m using 1500-grit here. R.O.B. watching over the NES, like a protective mother hen. I am assuming that most people don’t have 1500-grit sandpaper sitting around the house, but everything else on the list is a common household item. The sandpaper will run you about $1 at any hardware store. If your local store doesn’t carry that exact grit, anything over 1000 should be fine. The sandpaper is used to polish the pins, gently removing built up grime and oxidation. A coarser grit will start damaging the pins by cutting into them too deeply. 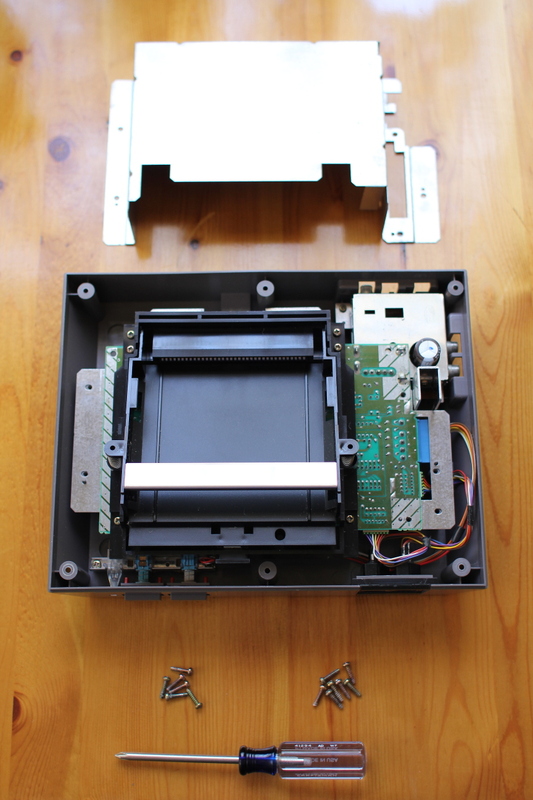 Start by removing the top cover of your NES. Turn the system over and remove the 6 screws holding the case together. Turn the system back over and lift the cover off. Next, remove the RF shield (the large shiny piece of metal covering everything) by removing the 7 screws holding it in place. You should now be looking at the cartridge tray and the problematic 72-pin connector into which the end of the cartridge slides. Go ahead and push on the cartridge tray to lock it into the down position, to get it out of the way. Grab your sandpaper and fold it in half twice, once lengthwise and once widthwise. Cut or tear along the crease to produce 1 quarter sheet. Set the rest of the paper aside, as you will not be needing it. Fold this piece in half twice with the rough surface facing out. You now have a piece of sandpaper that is rough on both sides and is thick enough to apply sufficient pressure to the pins. Starting on one end, gently move the sandpaper in and out of the connector 10 times, applying alternate pressure to the top and bottom row of pins. This will remove the corrosion and oxidation built up on the pins without bending them. Then pull the paper out, move over the width of said paper, and do it again. Repeat until you reach the other end of the connector. Always move the paper in and out, and never side to side, as this may bend the pins. This step should be done gently and carefully so that you don’t accidentally snag the pins and bend them. 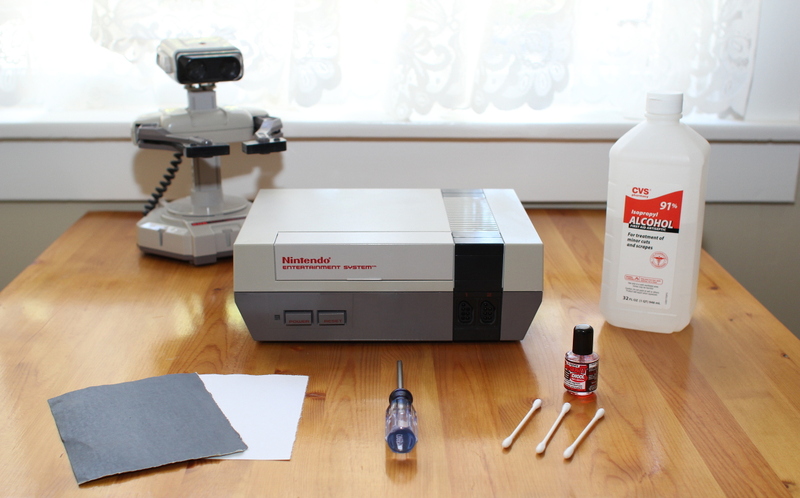 Once you’re done, use the can of compressed air to blow out any debris that collected inside the connector and inside the NES in general. Next, take the white paper and cut it in half. Fold one piece in half enough times that it will apply gentle pressure to both rows of pins when inserted into the connector without fitting too tightly. Use the Q-Tip to dampen both sides of one edge of the folded paper with the rubbing alcohol. The paper should be damp, but not wet enough to fall apart. 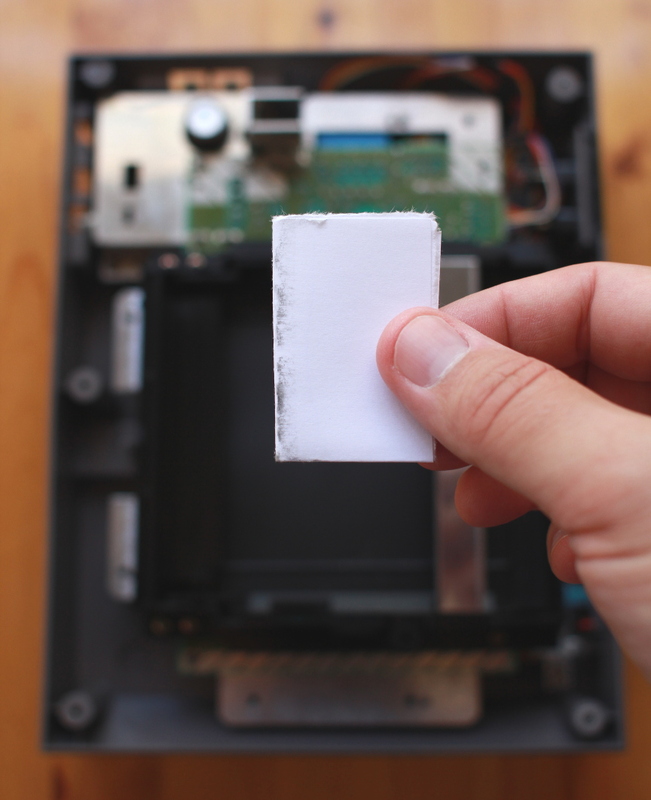 Move the damp edge of the paper in and out of the connector. The pins will leave little black marks on the paper. You can never get the contacts so clean that the paper will come out white, but you don’t need to. After a few minutes the pins should be sufficiently clean. Once again blow the connector out, both to dry the alcohol and to remove any bits of paper left behind. White paper dampened with De-Oxit. [Optional] If you have some De-Oxit on-hand (and you really should as part of a classic gaming tool kit), repeat the same white-paper step using De-Oxit to dampen the paper instead of alcohol. This will both help clean the pins and protect them. While not necessary, this will help to keep you from having to repeat this entire procedure in the near future. Test your system before putting it back together, as you may need to repeat the process if your connector is extra-dirty. At this point, your connector should be restored to its original state. The only way to know will be to test it out with a game, which you should do before putting your system back together. But before you grab a game and shove it into your now pristine system, make sure you clean it first! Instructions on how to properly clean your games can be found HERE. Once your system has been restored to proper working order, it is important to make sure that you keep it that way. You should never insert a game into your NES that has not been properly cleaned, meaning that you should go through your entire library and clean every game before using it with your now-clean console. It is also a good idea to periodically clean your system with a dry cleaning kit, as repeated exposure to rubbing alcohol promotes oxidation (you can also use De-Oxit for this.) While this does nothing for a connector that is too far gone, it help keep a clean one from becoming dirty again. If, after completing the procedure and properly cleaning and testing a few games, your system still does not work properly try repeating the steps above. It is possible for the pins in a NES connector to become bent or even broken, in which case a replacement connector is going to be your best bet. If you are feeling adventurous or have experience soldering (or want to acquire some), it is also possible to disable the 10NES chip in your system, although this shouldn’t be required if your system and games have been properly cleaned. While we aren’t totally down on the idea of replacing your connector, it’s more work than cleaning the one you have because you have to further disassemble your system. You also have to order one from eBay or online merchants elsewhere, and the quality can vary as these are made by third parties and are not original Nintendo parts. Finally, although it will fix your problems in the here and now, you will end up with the same problems down the road if you don’t learn how to properly clean and maintain your system. The NES is a great system but it is more high maintenance than other classic consoles, as it takes a bit of work to keep it running. 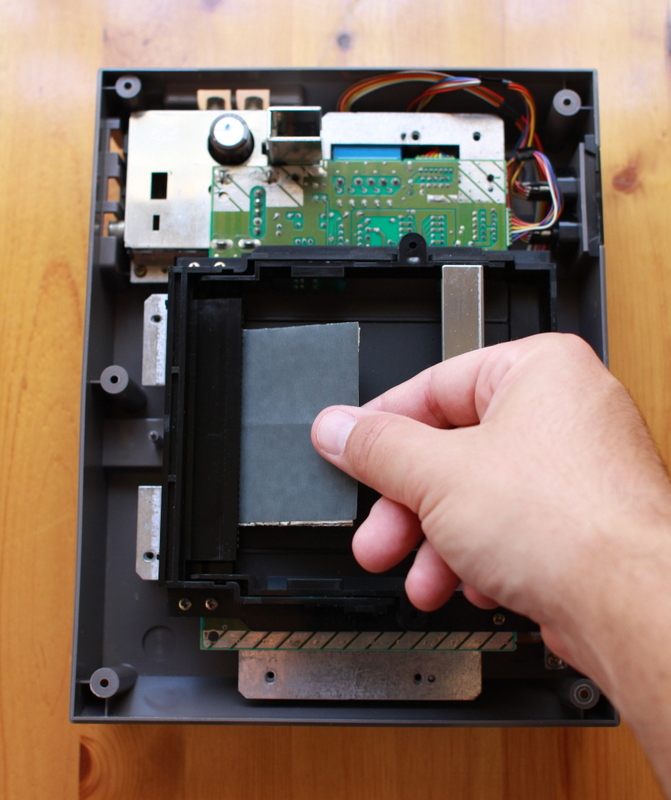 You have to get into the habit of cleaning any new NES cart you bring home before sticking it into your console, and you have to immediately re-clean any game that doesn’t boot up on the first try. And you have to NEVER blow into one of your cartridges again. If you can do those things, your NES will continue to serve you well for years to come. See also: Cleaning your cartridge-based games the right way! NES artwork originally by Sykonist and used via the Creative Commons license. The resulting derivative work may be freely used and altered as long as credit is given to Classic Gaming Quarterly. Tagged how to fix blinking nes, how to fix my nes, nes repair, replacement nes 72 pin connnector, replacement nes connector. Bookmark the permalink.